Most people long for a few hours relaxation, so as to cope with everyday life. Group meditation with genuine eastern bowls is an experience in itself and an opportunity to find inner calm. 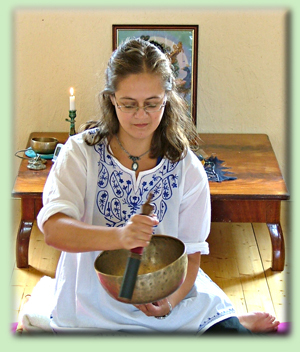 Use of 14 genuine Tibetan bowls, small cymbals, and a gong creates an orchestra of different tones and frequencies. You lie comfortably on a yoga mat and unwind. The vibrations are felt throughout your body as the instruments are moved around the room. Most feel ‘at home’ with the sound with some seeing colours, others seeing a variety of shapes in their subconscious. Others fall gently asleep. Relaxation of the mind and intellect provides the background for total physical relaxation. We begin with an introduction to the high quality eastern bowls and their interesting history. We suggest bringing comfortable clothes, slippers or socks, a small cushion or pillow and a water bottle. Group meditation takes place at the Farm House at Edens Garden when combined with rental of the property. Alternative locations, by special arrangement, at Yoga Sala or another fine location called Bråstaborg, both in the nearby town of Sala.